August 8th. Sharkettes sob. They wear tiaras and filigreed cheerleader uniforms. Their right hands cover their hearts. While the Jacksonville Sharks of the World Football League warm up before a game, the voice of President Richard M. Nixon sounds from loudspeakers across the stadium. The president says he will resign from the presidency the next day. In three months he will say to a televised audience the words for which he’ll be most remembered: “I’m not a crook.” He will later tell David Frost that when the president does something, that makes it not illegal. As the Sharks warm up on the field, the Star-Spangled Banner is played through the Gator Bowl’s loudspeakers. 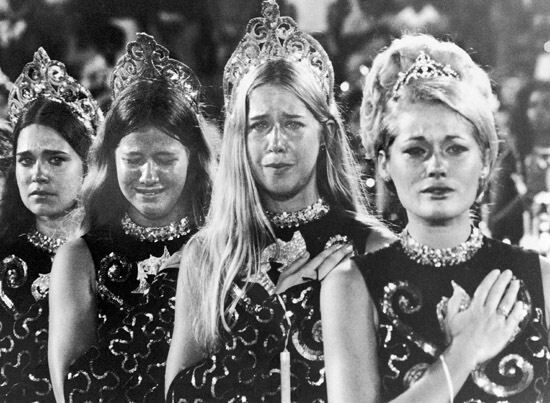 Sharkettes pledge allegiance in their tiaras and their faces crumple in their weeping. The whole history of the WFL’s Jacksonville Sharks will consist of seven games played the year President Nixon left the White House for defecating on his country.